New research highlights the extent to which epigenetic variation is influenced by both inherited and environmental factors. Epigenetic processes affect the expression or activity of genes without changing the underlying DNA sequence and are believed to be one mechanism by which the environment can interact with the genome. 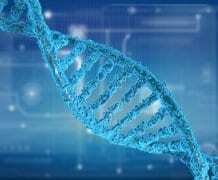 Now, an international group of researchers including teams from the University of Exeter, King’s College London, and Duke University in the USA have published a study in PLOS Genetics, using a unique cohort of over 700 pairs of twins to identify the factors influencing chemical modifications to DNA across the genome. In the study, funded by the Medical Research Council, the team compared the similarities between identical and non-identical twins, and found that epigenetic marks are more similar between identical twins – highlighting the role of DNA sequence variation in regulating gene activity. They also found that sites at which epigenetic variation is strongly linked to environmental exposures – such as smoking and obesity – are also partly under genetic control. The paper, “Characterizing genetic and environmental influences on variable DNA methylation using monozygotic and dizygotic twins”, is published in PLOS Genetics and is available online here. Authors are Eilis Hannon, Olivia Knox, Karen Sugden, Joe Burrage, Chloe C Y Wong, Daniel W Belsky, David L Corcoran, Louise Arseneault, Terrie E Moffitt, Avshalom Caspi, and Jonathan Mill. Additional support was provided by the National Institute of Child Health and Human Development, a Distinguished Investigator Award from the American Asthma Foundation to Professor Mill, and by the Jacobs Foundation. Some of the work reported in the study used a high-performance computing facility partially supported by a grant from the North Carolina Biotechnology Center.